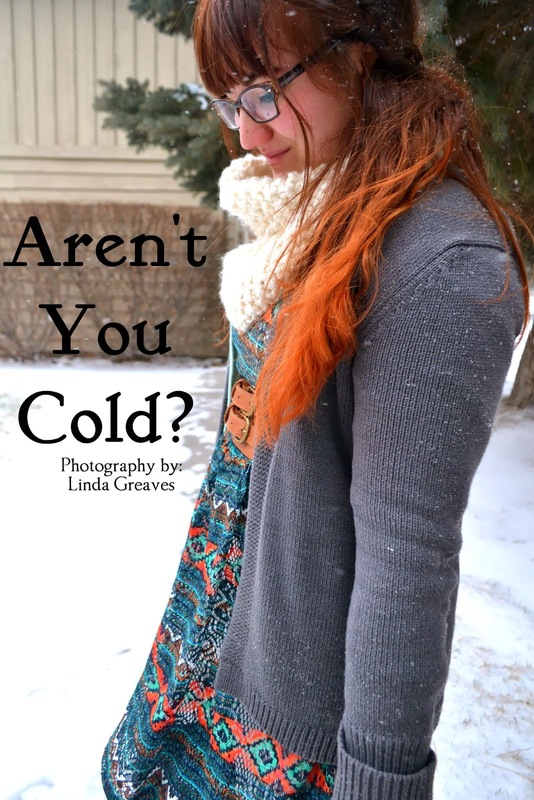 That's always the first question I get when I wear a dress during the fall or winter - especially on snowy days! For those cold, wintery days, I often don't mind donning a dress as long as I've got my fleece lined tights on. And the day I woke up to this winter wonderland, I was definitely not in the mood to squeeze myself into some pants. So this oversized dress won. 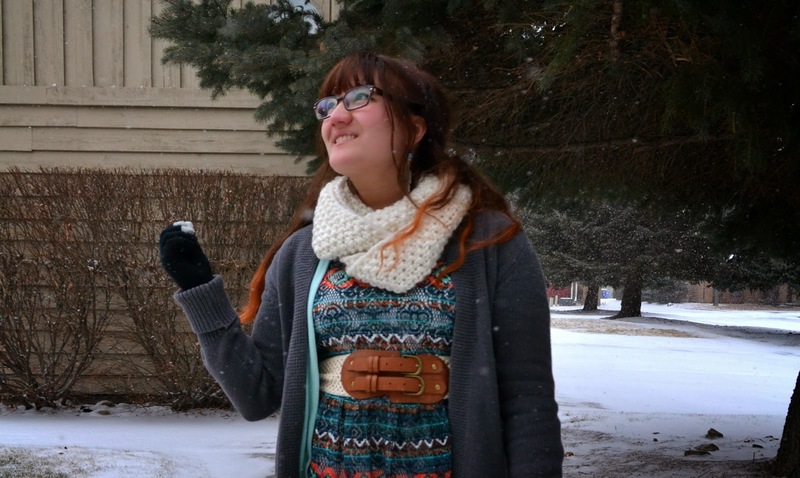 However, when I emerged from my class later that day, I walked out into a snowglobe that someone had just shaken! There was snow flying everywhere, and the wind had kicked up. Um, yeah, this dress isn't exactly a bodycon fit. I awkwardly penguined my way to my car and drove back to the apartment to change. However, I decided I might as well get this outfit documented. It was too pretty not to share! Haha, I don't think I've featured this dress on the blog yet, and it's an old summer clearance find from Target. The overlay material (crochet? ), tribal patterns, and rich colors make for a great pick-me-up for dreary days! Soooo...I have some wonderful news to share with you - I GOT A NEW JOB! Anyway, last month, I had an interview at Moxie Java. It went amazingly well (one of the regular customers met me during that interview and told the boss that, "She has a great smile!" Then he turned to me and added, "Well, I'd like to give you an advanced congratulations!" and it seemed like the owner was going to hire me right away. However, some complications came up and there was a misunderstanding (he thought I wanted to work both my GC job and the one he was offering me). Anyway, when I followed up on it, he seemed really regretful in telling me right then wasn't the best time. However, he wanted to keep my application on hand and promised that he would give me a call if anything came up. Well, you guessed it, something came up! He lost some weekend help (which is exactly what I'm looking for, what with school and all), and hired me right away. So now I'm a barista in training! I'm so thrilled to get this job! It's definitely going to be challenging learning everything (you have no idea...it's pretty intimidating really, especially when they get slammed with a line inside and a drive-thru line!) but I look forward to the day when I'm more comfortable and confident in what I'm doing. I've always been a caffeine addict, so to get to work with it and get free drinks is a definite perk! Plus, the people I work with are awesome! They're such fun, hardworkers and are super helpful in explaining stuff to me. Hope you all had a lovely Valentines weekend, whether it was spent with a significant other or just a bunch of loved ones in your life! Perfection Linda, "sheer' PERFECTION. I learned all I know from you......lol. I love the knitted snood and the knitted belt that just shows a titch. Oh I've missed so much Linda! First off, I'm so happy that the Imagine Dragons concert was everything you imagined (haha puns). I love soulful singers who really get into it. Second, HAPPY BIRTHDAY! How wonderful of Corina to organize a surprize party! And you are so right about V-day. Love your attitude. Okay, CONGRATS on the new job! Being a barista sounds complicated but fun. And I'm sure that your friendliness will realyl connect with the customers. What a serendipitous opportunity! Best of luck figuring out the what to do with your old job too. I saw that instagram post and was so happy for you. I'll be praying! I get the same question haha. I prefer skirts and dresses over pants any day, so I'll wear tights and carry my dresses into winter. Target is honestly the best--love that cool print. And the belt balances the boots so well. This look really compliments your vibrant hair as well! Looking gorgeous dear.x I absolutely love your outfit, the dress is gorgeous and I love how you made it Winter appropriate! I hate windy days as I always end up changing my skirts into pants in order to avoid the embarrassment. Congratulations on your new job, I am sure you will be great at it! Have a lovely week! woohoo to getting a job!! =D yay! love your look and those glasses! And congrats on the job, Linda! Love your Aztec print dress and the scarf is so pretty. Congrats on the new job!! Loving that fun colorful print! These photos are so cute! Congrats on the new job, hun. Fantastic work! It definitely looks super cold over there, complete opposite to here. Love the pattern on the dress. haha, "penguined your way"... that's the perfect way to describe it, lol. I adore your terminology. You do look cute and cozy here, though, even if the wind was trying to sneak under your dress and give you some Marilyn Monroe-esque poses, bahaha. 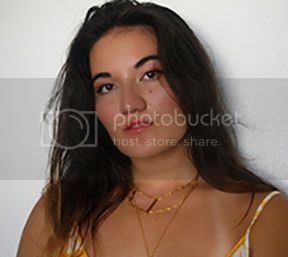 Definately the right decision to post this look, you look so nice in this dress and the belt looks really great, Congratulations on your new job, sounds like you're gonna have a lot of fun. Oh you look stunning! I love the pattern of the dress. And omg, congratulations on the new job. Well done, Linda! Congratulations on your new job! Finding one seems like such a challenge these days. I've seen fleece lined leggings at Marshall's - how are they? Do they keep you warm? Congrats on your new job <3 You are going to be amazing and enjoy every minute. Your hair looks so red in this pictures!!! It was a shame you need to change because this outfit is very pretty. Linda, I LOVE that dress! What a gorgeous print! I love tribal prints. The colors looks fabulous on you and I love the sweater and boots you paired it with. The photos are gorgeous girl. Super Congratulations on your new job! The scheduling worked out perfectly. You are a SMART COOKIE girl! You'll have those recipes down pat in no time. You may even make up some for them to use. LOL So happy for you! congrats on your new job linda, sounds great! and i must say, your hair looks stunning in theses photos! and i love the dress. Congrats on the new job!! I wish I knew how to make fancy coffee. And the hair! I like the new color :) It's very vibrant and suits your personality! You look adorable, what a nice dress! I love gray tights for winter. Your outfit looks perfect with the gray color. Yay, congrats on the job Linda, I know you're going to make the best of it, sounds like a great place to work at. 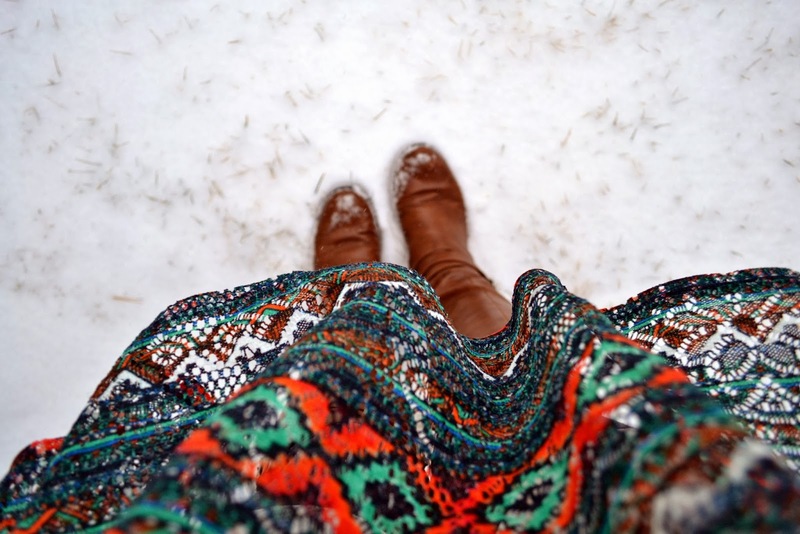 This dress is the prettiest, love the print and knit, the perfect cure for a cold icy day. You look beautiful. Thanks for sharing your opinion with me on your last post. 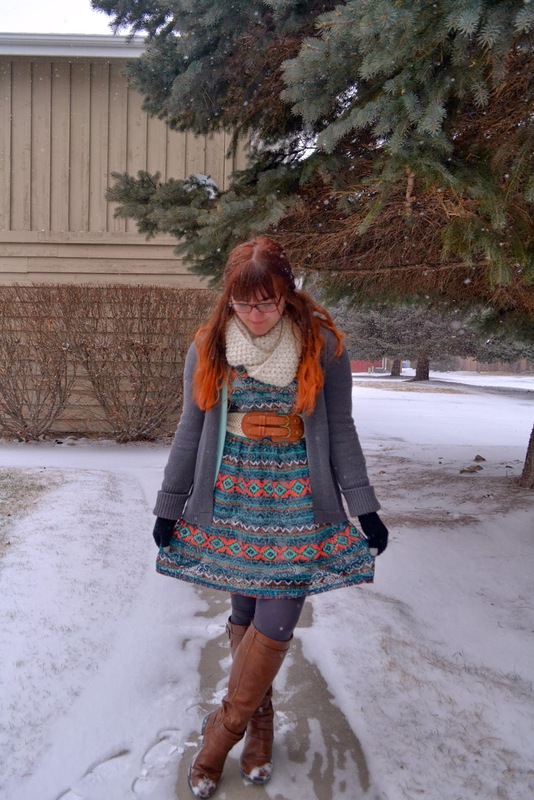 I think the dress is adorable--- even if it was cold! Congrats on the job! Speaking from experience-- serving jobs can make crazy money, so don't give it up just yet--- you might find it financially worth it! as for the outfit, it's just so perfect! I love how you have included different shades of brown. woah, you're gonna know how to make such yummy coffee!! congrats on the new job, and the waitress promotion! also, i find fleece tights warmer than my jeans, so what do people know haha. though i can see the wind being an issue! I love how your hair compliments your dress.. Absolutely gorgeous. And I love your snood! Congrats on your new job Linda! Before, I've always wondered why you're not working in a coffee shop or something since you love caffeine! Now you get an opportunity and I couldn't be more grateful for you!! Congrats on the new job!! I know you'll do awesome!